Combine zucchini, garlic oil, salt, pepper, oregano, and Parmesan cheese into a bowl. Toss thoroughly to combine and allow to sit while you make the pork. Heat a large non-stick pan over medium heat and spray with cooking spray. Season pork with salt and pepper. Dredge in flour and then cook for 3 – 4 minutes per side until pork is no longer pink in the center. Blend yogurt, mayonnaise, mustard, lemon juice, honey and oregano until smooth in a blender. 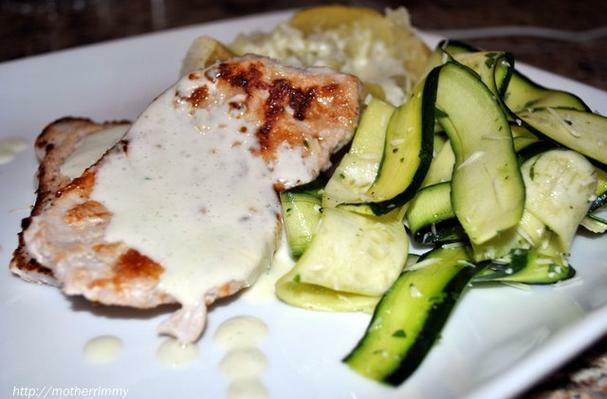 Serve pork with zucchini salad and yogurt sauce.